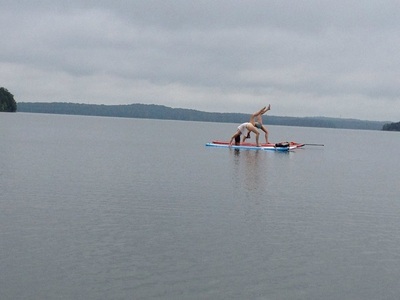 ​Take your practice outside, try new things, get out on the water, and enjoy the lightheartedness of yoga on a paddleboard! After falling in love with SUP Yoga in the Summer of 2013, Rebecca completed her training to become a SUP Yoga instructor and has partnered with Nashville Paddle Co. to be able to teach these unique and playful yoga classes. By taking your yoga practice outside in this way you can experience the beauty and serenity of nature, the freedom of being out on the water, and take in all the sights and sounds of the peaceful lake location. These classes will include an introductory lesson in paddleboarding and paddling, so SUP beginners are absolutely welcome! Beginning yogis are welcome too! The SUP Yoga classes will contain a mix of yoga postures that you would find in a "land-based" class with the additional playful component of practicing on the paddleboard in the water! (Falling into the water is very common and almost a part of the experience! The water is refreshing and the boards are very easy to get back on, so no worries needed about that!) Intro to SUP classes are perfect for learning the basics of SUP, paddling technique, and turns without the Yoga. These classes are great introductions for beginners and those looking to add more refinement to their paddling skills! Class registrations will need to be made in advance through Nashville Paddle Co. website. Rebecca is also available to teach private SUP and SUP Yoga sessions for individuals and groups of up to 10 people!